The Walking Dead Credits Cut Steven Yeun's Name: Is Glenn Really Dead? The Walking Dead Credits Cut Steven Yeun’s Name: Is Glenn Really Dead? Not only did The Walking Dead make us sit through 90 Glenn-and-explanation-free minutes on Sunday, Nov. 1, but the AMC zombie drama also had one telling omission from the credits. Actor Steven Yeun, who plays everyone’s favorite pizza delivery man-turned-badass, was no longer featured in the show’s opening credits. With fans wondering whether Glenn really did or did not die in last week’s gruesome Walker attack with Nicholas (Michael Traynor), this credits cut could mean the end of Mr. Rhee. But ever since Glenn was dragged into the pit of Walkers after Nicholas shot himself, diehard Walking Dead fans have been speculating about the reality of his condition. Many believe that because Nicholas fell on top of him, those were his organs we saw being strewn about. Things got even more suspicious when Yeun did not appear on The Talking Dead after show, which is customary for actors exiting the series after a death. 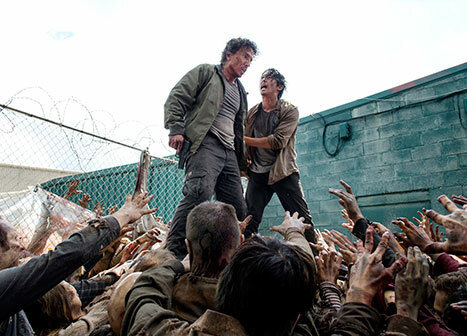 Even showrunner Scott M. Gimple wasn’t willing to write Glenn off so quickly. “In some way, we will see Glenn some version of Glenn or parts of Glenn again, either in flashback or in the current story to help complete the story,” Gimple told The Talking Dead shortly after the Oct. 25 episode aired.